Fine American Federal candlestand in maple, having a rectangular cut- corner top above a vasiform pillar and raised on three downswept tapered legs. Circa 1790. Rare Chester County Pennsylvania Spice Chest in walnut having a moulded cornice above a raised panel door opening to an arrangement of ten small drawers (one replaced) and raised on straight bracket feet. Secondary woods include: poplar, oak, walnut and beech. There is a faint inscription on one of the bottom drawers. Pennsylvania, circa 1760-80. Federal Mahogany Pembroke Table with secondary wood of poplar, having rectangular top with two shaped drop-leaves above a frieze drawer, flanked by reeded pilasters and raised on reeded, tapering legs ending in brass casters. New York, circa 1810. See illustration of similar table from Federal Furniture and Decorative Arts at Boscobel by Berry B. Tracy. Antique American Painted "Fancy Chair"
Wonderful faux grained and stencilled American “fancy chair” with stencils of an eagle and basket of fruit, faux grained seat and yellow highlights. Circa 1840. Late Federal Tripod Candlestand in Maple, having a rectangular top with cut corners, a turned vasiform pillar and raised on three downswept tapered legs. New England, 1790-1810. Antique American candlestand in cherry having square top with “baby’s bottom” corners, nice vasiform turned pillar and cabriole leg ending in pad foot. Circa 1780-1800. Antique Federal Southern Sidechair in walnut, having a shaped crest rail above an openwork splat, upholstered slip seat and moulded, tapered legs joined by an “H” stretcher. Circa 1790-1800. 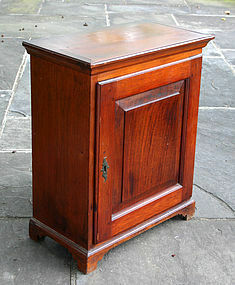 Antique American Mahogany Tilt-top Table, the single board round top supported on a pillar of tapering shaft, urn and rings; the legs with plain knees ending in simple pad feet; the lower edges of the pillar and knees attractively scalloped; the overall form typical of Massachusetts.